Sorry but that new livery looks a right old mess. There's very little wrong with the existing classic EYMS livery. I’m probably in a minority of one, but I think that’s a lovely livery. Very cheerful. And I formed that opinion before reading your post, snoggle 😂 Each to their own I guess! This reeks of Ray Stenning's Best Impressions consultancy - wonder if I'm right! My only comment, based purely on the photos here, is that the dark green rear doesn't fit well with the rest of it. Maybe in the flesh?! Make that two, it looks great to me. The biggest problems for me are all the place names on the E400 (looks like a classic example of 'fill that empty space') and how this new livery will make lower panel replacements more difficult than they need to be! Do like the modern take on the classic though. No I like it quite a lot as well except for the logo - that’s the only bit I feel could be better. The livery was designed by Best Impressions. Personally, I think the livery is fantastic and gives a fresh, modern, clean image to an old established brand name, a bit like the new Waitrose and John Lewis brands. I admit to some colour blindness issues. Now you point out the rear is burgundy, I can just about make that out. The sea is always a wine-dark colour to me. I obviously need to see the livery close up and in the flesh. As a postscript to this, when GA purchase First Manchester QR this will reunite East Yorkshire and former EYMS - Finglands route 41 under common ownership. A similar reuniting has occurred to London route 41 too! When MTL bought Gemsam including London Suburban in 1995 it gave London route 41 common ownership with MTL. MTL then dumped route 41 in 1996 and it was reassigned to Arriva. In 2000 Arriva purchased MTL, therefore giving MTL and London route 41 common ownership again. On top of this, Arriva had by then acquired the former London Suburban base in Edmonton (EC), and for a few years Arriva ran school journeys on the 41 out of its former home at EC. So you could say the 41 was reunited with London Suburban in more ways than one - and history is now repeating itself with part of the 41 allocation being oustationed at EC. GA East Yorkshire have just ordered a batch of Enviro 400-MMCs for Hull - either 13 or 16, I forget how many. By the time EYMS sold out to GA they had coincidentally bought some EvoSetis. 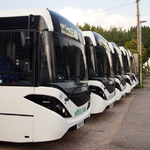 Both GA London and GA East Yorkshire have thus switched from EvoSetis to Enviro 400-MMC models for recent or imminent deliveries. More surprisingly, Brighton & Hove have ordered some hybrid Enviro 400-MMCs too after a few years of Scania or Wright (Volvo or integral) deliveries.